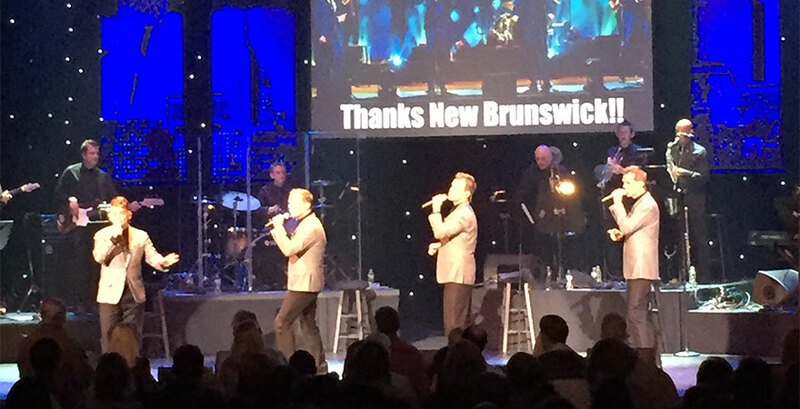 The Midtown Men brought the music from the 1960s to State Theatre New Jersey on October 6. The quartet is comprised of four of the original members of the Tony® and Grammy® Award-winning Broadway musical Jersey Boys. The four talented men began touring as the Midtown Men in 2010; they have logged an astounding 600 shows. Jersey Boys opened in 2005 and brought them much success. Prior to their fame with the Broadway musical, these singers were in show business, but it was when they were discovered and recruited for the show that things began to change for them. In light of the Broadway show targeted to close in January, the quartet reminisced and was nostalgic about their run. They recalled opening night at the August Wilson Theatre when members of the Four Seasons and The Sopranos were in the house. They introduced each other and talked about their early beginnings in showbiz up until Jersey Boys. Their resumes include other theater and entertainment experiences, all detailed in the State Theatre’s program. They are likeable, not only because they are talented, but they are humbled by their successes. At one point, they mentioned the tough lesson of realizing that it wasn’t about them, but the music, and then they proclaimed their love for us (the audience)as they segued into Buffalo Springfield’s “For What It’s Worth.” This chapter in their careers seems to be a perfect fit as they fell in love with the music of the 60s; their subtitle Sixties Hits with a Modern Twist is apropos. The show included songs such as the Youngbloods’ “Get Together,” The Young Rascals’ “Groovin,” and “Good Lovin,” The Mamas and the Papas’ “California Dreamin,” and John Lennon’s “In my Life.” An upbeat show, it brought back some real gems of the 1960’s musical scene, which according to them is the greatest decade for music. The four members called out their band musicians, paying homage to their talents. During a short break as the singers left the stage to change outfits, the musicians played themes from various TV shows of the 1960’s such as Hawaii Five-O and the Pink Panther. Different photographs were displayed on the projection screen, and at one point, they paid tribute to Motown. Michael Longoria lead the Jackson Five’s “I Want you Back,” a highlight of the night. They also sang the music of the Temptations and Marvin Gaye. Peppered throughout the show were some Four Seasons’ hits. As they neared the end of the show, they sang the ever popular “Oh What a Night” and we all got up to dance. The encore, “Bye Bye Baby” ended the lovely evening. The Midtown Men aim to please and they do holistically with talent, music from the greatest decade, and élan. They breathe new life into the music of the past, make it their own, and then share it with the world, one show at a time.